Starting an E-Commerce store has never been easier. You don’t even need stock anymore. Discover the power of dropshipping and eCommerce platforms, which more and more shop owners are relying on to run successful businesses for less. E-Commerce is growing 23% year-over-year, with an increase in online orders of 8.9% in Q3 2016 alone, according to this report. This is hardly surprising considering that 80% of Americans shop online at least monthly. Clothing, shoes and accessories are among the best-selling products, bought by 60% of shoppers. Other products customers like to buy online include books, movies and music (55%), beauty items (31%) and computers and electronics, (29%). Most E-Commerce sales (55%) are carried out through branded stores, while Amazon alone, the world’s largest online marketplace, amounts of 36% of sales. It is estimated that there are as many as 24 million eCommerce stores in the world, but the high rate at which new stores are opened makes this hard to estimate. Interestingly, only about 110,000 of all online stores actually generate significant revenue. Other studies estimate that only 650,000 of all e-commerce stores generate annual sales of more than $1,000. In addition to a wealth of online resources such as website templates, tailored hosting services, outsourcing platforms for web development, and customer support services for hire, shop owners now have access to dropshipping. Shops that use dropshipping don’t have to stock the items they sell. Instead, they send customer orders straight to wholesalers, manufacturers, or suppliers, who ship goods directly to the customer. Dropshipping has a positive cash flow circle and virtually eliminates the high cost of maintaining an inventory. The history of dropshipping can be traced to Alibaba, today one of the largest E-Commerce company in the world. Rather than holding inventory itself, which would have amounted to colossal expenses given its huge catalog of products, Alibaba routed orders to its vast network of Chinese suppliers, who then sent products straight to customers. Dropshipping eliminates inventory risks. This can be a game changer for many E-Commerce sites, especially when you consider that $1.5 trillion of worldwide merchandise annually is in an overstock position. With dropshipping you don’t have to keep stock, worry that goods won’t sell, or order minimal quantities – products can be shopped on a per item basis. Dropshipping helps you focus your time and energy on growing your business, not on overstock or understock. Dropshipping is not without its risks, tough. Backordering, slow delivery, and low-quality products can pose shop owners problems. But these can be eliminated by choosing reliable dropshippers with a proven track record. Today, when more and more dropshippers are evolving into highly successful ventures, this does not have to be a challenge anymore. Using on-demand, online printing, fulfillment and shipping platforms like Printful.com or Teelunch.com as dropshipping examples, these platforms enable you to use the latest digital printing technologies to create unique products such as clothing, cups, or tote bags. They enforce quality standards that guarantee every product is what your customers expect it to be. They even package and tag your brand to the item. Because they handle everything for you, you can focus on the designs themselves, passing to them the best possible creative artwork. These numbers are only estimates. Cost per shirt varies depending on the printing & dropshipping service used, the material, the design, the color of the shirt, the number of products ordered, and other factors. Some custom printing and dropshipping services operate outside of the US, but because of the huge orders they are getting they can afford to maintain a good quality service, together with English-speaking customer support teams. It is possible then for shop owners to strike a good balance between the money they pay on dropshipping and the value they get in return for it. The advantages of dropshipping have given rise to more and more small individual E-Commerce websites. These tend to be specialized stores with running costs below a few hundred dollars a month. In turn, this drives more shop owners to make use of shopping cart platforms like Shopify that include all the essential features they need to sell and manage a shop under the same interface. 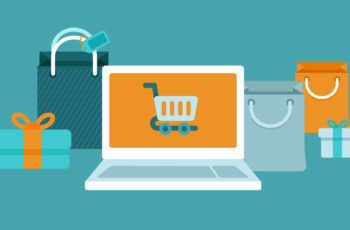 Shop owners have come to prefer these versatile, highly-integrated shopping solutions that work great with dropshipping over more traditional E-Commerce platforms like Woocommerce, Opencart, Zencart. The platforms mentioned above are all free, with optional paid plugins or premium themes, but advanced customization requires coding knowledge. Shop owners who are not programmers or web developers have to outsource this kind of work, which creates not only additional expenses, but can slow down development time. Setting up these traditional shopping platforms and customizing them to create a unique user experience can take weeks. Maintenance is another issue, as sometimes a plugin can break after an update, or different plugins can give rise to incompatibility issues. Even if you are already familiar with CMS solutions like WordPress or Drupal, the learning curve for setting a new website is still steep. That’s why shop owners are looking for alternatives. That’s where Shopify, BigCommerce, and other similar platforms come in. With Shopify, most of the traditional steps to setting up an online store are cut down to a minimal setup and easy, even enjoyable shop customization process. You get to access a wide range of customization options, and can give your shop a unique flavor with themes and more with just one click. Shopify also comes with the advantage of being hosted on a stable platform that is fully managed and that comes with a support team that can promptly answer any questions you may have. With Shopify you can forget about the technicalities and focus on creating the most engaging customer experience possible. Backed by a huge community of both shop owners and sellers, Shopify is a flexible platform that has shown that it can incorporate the functionality that its users want. Unlike E-Commerce CMS solutions like Woocommerce, with Shopify you don’t need to trial and error a plugin, integrate with Facebook ads or Mailchimp, automate retargeting ads to encourage shoppers to come back to complete the cart, or use plugins for discount coupons. All these are built into the platform and easy to access. The disadvantage of Shopify is the monthly fee, but the money you pay frees you to focus on building your business, not tinkering with the back-end process. With Shopify, you can open a custom online shop in a day and run it for as low as $29 for a basic plan, plus small credit card processing fees for online transactions and in-person purchases. E-Commerce platforms like Shopify and BigCommerce have done a lot of complex integration with dropshippers to make it easier for you to run an online shop. Services like Printful.com and Teelaunch.com can print, fulfill, and dropship custom t-shirts, phone cases, hats, bags, canvas, pillows, mugs, and more. Both of these can be integrated seamlessly into your Shopify store. Once a customer places an order in your store, order information is automatically passed on to the dropshipper who takes care of the order. To streamline the process, prepaid credit is being used. You pay the provider in advance, and they auto-deduct from it once the order is completed. This requires an investment lower than holding stock would entail, and comes with fewer risks. Maybe It’s Time to Start a Store? Today, when dropshipping and E-Commerce platforms like Shopify make starting an online shop not only cheaper, but also easier than before, almost anyone can start selling products online with a minimal budget. The tools and strategies discussed above do not guarantee success, but they give you the opportunity to turn an idea you are passionate about into a viable business. A great example of this is the 22-year-old university student Melvin Chee from Australia, who used dropshipping and Shopify to start an online store with less than $100 investment. If you’re thinking about building a successful online shopping website, this may be the right time for you.